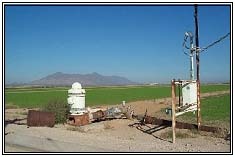 The Basic Data Unit is the Arizona Department of Water Resources' primary source of groundwater data. Basic Data (BD) is responsible for collecting groundwater levels throughout Arizona as well as developing Open File Reports (OFRs), Hydrologic Monitoring Reports (HMRs), Hydrologic Map Series (HMS) reports, Water Level Change Map Series (WLCMS) reports, and other hydrologic data. HMS reports are in-depth studies of groundwater conditions by basin, while WLCMS reports provide water level data from the two most recent collection periods within a basin. BD, along with Geophysics/Surveying, is also responsible for conducting a wide variety of data collection activities in support of the Statewide Hydrologic Monitoring Program. Basic Data uses several methods for data collection. For many years its primary groundwater-level measurement method has been an electronic sounder or a steel tape that takes a discrete measurement. BD uses these methods to measure a series of approximately 1,800 “index wells” annually across the State. In addition, BD periodically conducts basin sweeps to measure water levels for all accessible wells within a specific basin or sub-basin. View the Basic Data Fact Sheet for more information. View a slide presentation of members of our BD staff taking a deep water-level measurement at the City of Williams' Rodeo Grounds Well # 55-584106. In approximately 120 wells throughout the state, BD uses automated groundwater monitoring devices that record water levels on a predefined frequency on a continuous basis. BD deploys automated data collection systems in the form of pressure transducers and shaft encoders that measure water levels four times daily and store the data electronically. BD retrieves the data quarterly by downloading the data to a laptop or memory card. 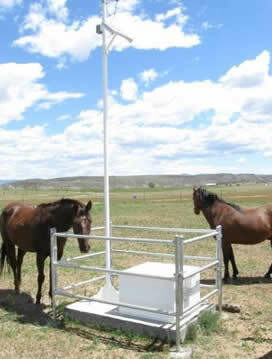 Data may also be retrieved from wells equipped with satellite telemetry systems for near real-time measurements. For more information please see our Statewide Automated Groundwater Monitoring Fact Sheet. BD stores its groundwater data in an ORACLE database known as the "Groundwater Site Inventory" (GWSI). GWSI is a field-verified database consisting of thousands of wells that include locations, current and historic water level information, and numerous associated data relating to those wells. Groundwater data can be viewed online using the GWSI Database and Wells Registry Database Interactive Maps. HMS reports and WLCMS reports are available online at the Hydrology eLibrary or may be purchased in print. To purchase copies of the HMS reports or WLCMS reports, please contact Information Services at 602-771-8627 for more information.